You might have noticed things have been a bit quite on the blog this week, and I’ve not been so active on social media. Well I decided to have some ‘time off’ and went with my family for a long weekend in Cambridge! (Before then heading off to London for a few days, but I’ll save that for a separate post) Before we went I decided I wouldn’t take the laptop – it’s always good to have a break I think, and when I’ve taken time off before it’s great to come back to blogging feeling refreshed and invigorated! Luckily, Cambridge is only about an hours’ drive for us, and we planned a couple of things to do before leaving. So on our way to checking into the Cambridge Central Travelodge, we thought it would be a good idea to stop off at Funky Funhouse. This is a massive soft play centre set away from the town on an industrial estate. Fred had the best time romping around with the other children there and after a couple of hours we headed off to check in at the Travelodge. Cambridge Central Travelode is conveniently located within a reasonable walking distance of the town centre. 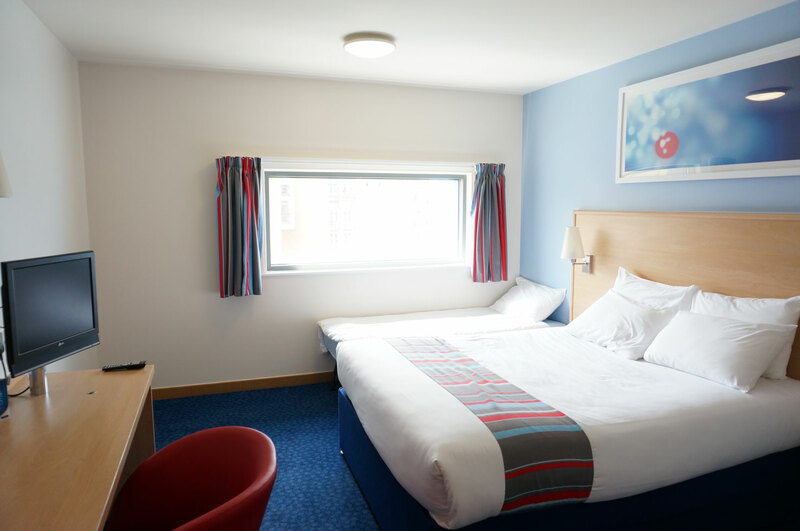 The staff were super friendly and helpful, and our room, was clean and spacious and had everything we needed – there was a TV, coffee and tea making facilities and an en-suite bathroom. We unpacked our bags and headed off for a quick look around Cambridge – unfortunately we didn’t quite make it into the centre as Fred was pretty tired from all the running around, so we stopped in a pub for a snack then went back to the hotel for the evening. I should also mention that the hotel is also handily located at the leisure centre complex, so there’s a mini Sainsbury’s and Tesco on hand next door if you need to stoke up on supplies. 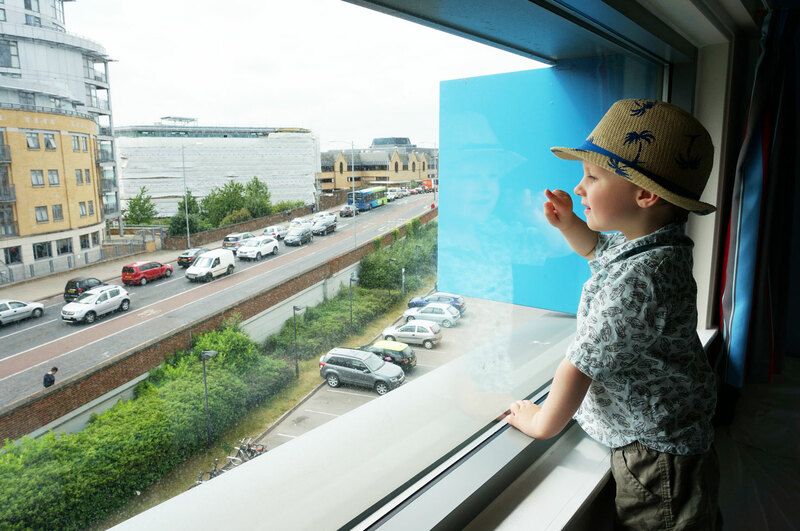 There’a also a cinema, gym, and loads of restaurants including Frankie and Benny’s, Chiquito’s and Bella Italia if you’re looking for something to eat but don’t want to travel into Cambridge centre. On the Saturday we woke up after a good night’s sleep – our room had air con, YES!! We headed into Cambridge for a look round the shops – I made a beeline for Kiko, John Lewis and Space NK (I’ll be showing you my purchases soon!) and we stopped for lunch at Zizi’s. 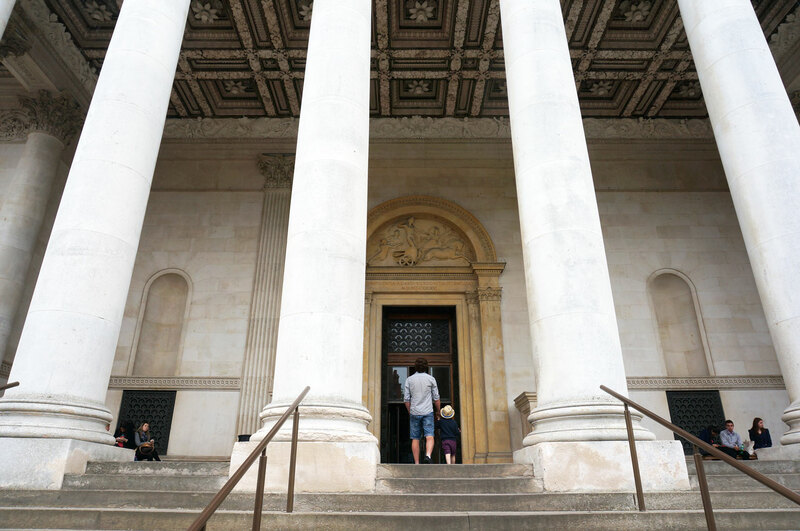 We then took a pretty long walk to the Fitzwilliam Museum, and got soaked in the rain! After catching the bus back – my legs were tired so Fred’s poor little legs must have been knackered! 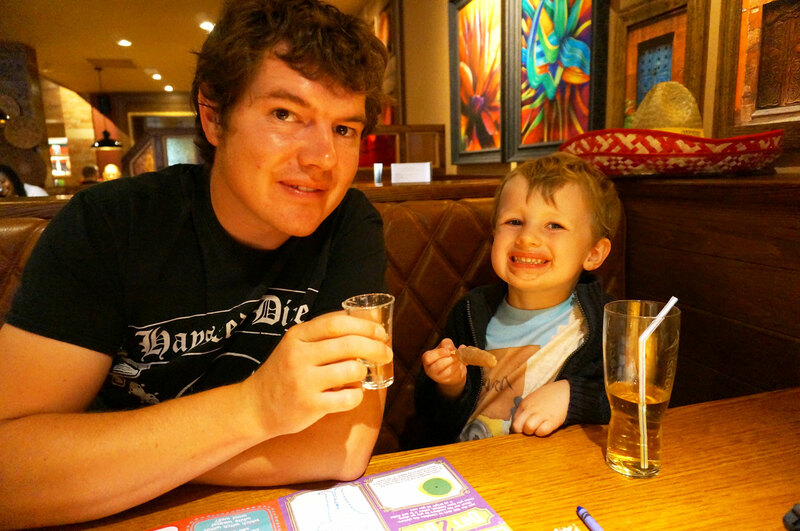 We went back to our room for a brew and a rest and headed out to Chiquito’s for our evening meal. We left early on Sunday, stopping at Funky Funhouse again before hitting the road home. Travelodge good points: Our room was clean and spacious. It was in a great location with all the leisure park facilities at hand. The staff were friendly and helpful, and our room was easily accessible and easy to find. 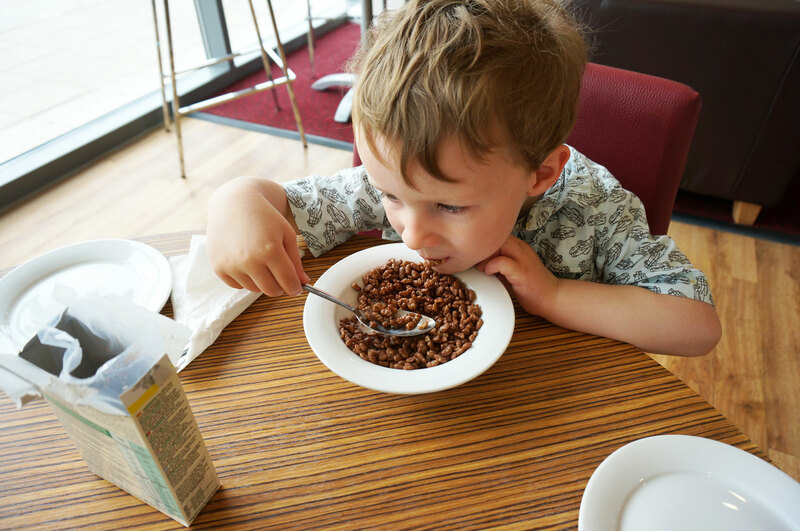 Breakfast was also an all you can eat buffet – one day Freddy had Cocopops as a treat then two helpings of sausages and beans! He was very happy! Travelodge points worth mentioning: When we arrived we found out this Travelodge doesn’t have it’s own car park. There *is* a car park but it’s for the Leiseure Centre, and costs £12 every 24 hours. Alternatively you can park at the nearby multi-story for a reduced rate of £7 per day. This isn’t the end of the world by any means but I thought it was worth mentioning. Cambridge good points: Cambridge has a fantastic selection of shops, I wish we had longer to explore! (and more money!) For the beauty lovers like me there’s stand alone stores for Penhalligons, MAC, Clarins, L’Occitane, Molton Brown, Jo Malone, Kiko, Space NK… and these are just the ones I happened to walk past! As Cambridge really isn’t that far away for me, I’ll definitely be heading back soon for a proper shopping spree! I’d really like to go punting on the river too! Cambridge points worth mentioning: As much as I loved Cambridge, it’s quite ‘touristy’ and clearly we stood out as tourists because the amount of times we got collared by student-type street sellers asking us to go on a tour, or punting (when it was raining) was quite ridiculous. This was literally my only complaint though, Cambridge really is a lovely place! I’ve never been to Cambridge either. I must admit hotels without their own car parks annoy me lol! For a 3 day mini break these extras can soon add up! I love that as mum we find a soft play area first! Not been but sure would like to give it ago as look very nice.